Reflections of a Grady Doctor: Bears repeating. I was walking through the hallway in the main lobby of Grady. I was supposed to be meeting a medical student and I was already late. My feet were going fifty miles per hour and my mind even faster. . . .
"Oh my gosh! Pardon me for not looking where I was going!" I looked up at this sweet-faced Grady elder that I nearly mowed down next to the gift shop. I reached down to gather the hat that had fallen off of his head and furrowed my brow apologetically. Instead of looking annoyed with me, he glanced down at me in my white coat with twinkling eyes. "That's okay, baby," he gently replied as I handed him his cap. His voice was rough like cookie crumbs and immediately I loved it. He paused for a moment then snapped his finger and then pointed right at me. A big smile crept across his octogenarian face. "Ha! Ha! I know you! You that TV doctor that be on Fox 5! Ain't that you?" Before I could answer he grabbed both of my hands tightly, studied my face some more, and came to his own conclusion. "Sho' is! Sho' is you!" He stomped his foot for emphasis. "Ha! Haaa! I be seein' you!" With every word, he kept squeezing my hands rhythmically and grinning from ear to ear. Man. He was so tickled to have me in front of him--which was kind of funny considering how those local Fox segments are only like three minutes long. "Yes, sir!" The "miss" instead of "doctor" title didn't bother me in the slightest. "You doin' alright today, sir?" I realize that I have an almost musical quality to my Grady-elder-Southern-respect voice. The words roll together and my intonation floats up and down like crescendo decrescendo notes. I first noticed it one day while giving an almost ninety-something year old lady directions in the hallway a while back. Every time I said, "No ma'am" or "Yes ma'am" I could hear it--musical. Different than the "No ma'am" I'd use for the fifty-something year old lady in the post office asking me if she could help me with anything else. I wondered in that moment if it was patronizing. "Baby, if I was any better I'd be twins!" This Grady elder sure didn't seem to think so. He just squeezed my hands again and laughed out loud. "I feel proud to see you! You know I be seein' you on the television, right? Sure do. And you a doctor, too? Go on keep it up, hear?" "Yes, sir." The song in my voice quieting a bit as I thought about what he'd just said. And so. He stood there just smiling at me and nodding for a few seconds more. So before I left, I reached out and hugged him tight. Tight like I'd known him for way more than those twenty seconds. It was natural and easy and reciprocated. I know, I know. If you've been reading here for a while, you've heard versions of this story before. 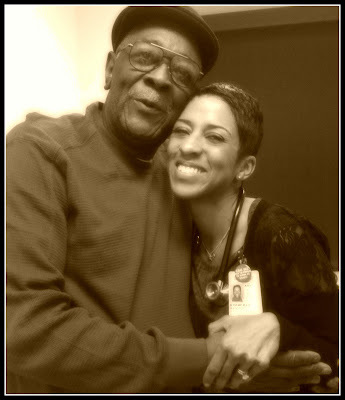 Grady elders seeing me in the hospital and telling me they feel proud. Me walking off thinking about who they are and what they've seen and where I am now. Yawn. . . I know. But honestly? It never gets old for me. Not ever. Every single moment like that stops me in my tracks and makes me want to write it down to honor it. Because I never stop feeling indebted or moved or lucky to be here, you know? I don't. Remember the time that man stopped me outside of McDonald's after I'd been on CNN? I am so happy that I wrote about it because I literally reread that story once every couple of months. And every single time I do, I cry and cry. Oh and remember when the two Grady elders broke out in song while waiting for the Grady elevator? Singing "I won't complain" at the tops of their lungs? The words used describe that moment have kept it closer to me. . .in high definition even . . . .because I don't want to forget it. I don't. And I won't. So pardon the redundancy. It's just that some things bear repeating. My meeting with that first year student was wonderful. I found him waiting for me patiently in the other entrance of the hospital scanning all that was around him. . . .the people, the sights, the sounds. . .all of it. He was standing tall and proud in his overly-white white coat that screamed "pre-clinical medical student". . .but that was okay. As I walked up, I looked at his cocoa-colored complexion and smiled; he could totally pass for a much younger version of the man I'd just left. "This place is amazing," the student said earnestly. I squeezed his hands just like that Grady elder had just squeezed mine. "Yes. . . it is. It really, really is." Young black MALE med student, elder Black man, and Black female doctor. I know this wasn't what your post was about, but it was for me! You could write about this same thing every day and it would make me happy again, every day. Every element in it charms my heart. Sho does, baby. Sho does. Like Ms.Moon, I could read these vignettes of you and the Grady Elders over and over. They speak of your life as a healer but also of humanity in general, and all that is good and whole about it. You seem to have this aura about you...I certainly feel this when I read your blog. From your writing, I think you ooze love, so your respectful lilting is probably not at all patronizing. My mother is 90 but still very VERY with it. It bothers me when I hear certain people, meaning to be helpful I'm sure, talking to her in almost baby talk - as though she'd gone simple - and I want to smack them upside the head because my mother has never been as stupid as they are being just then. Just sayin'. We don't have any southern respect for elders here, just in case you were wondering. I'mnot in the south but I love the elders too. I literally heard my mother say yes sir or yes ma'am throughout my life and days before she died. It's never "yawn", never ever... Please keep chronicling and sharing these precious moments here, they are important beyond words. You've stolen my heart, you have. I do love the elders.